New York 2012 Saturday- Day Two « How Do You Measure 525600 Minutes? I’m going to try to write this using the free Wi-Fi in Times Square. It’s a little nippy out, about 54 degrees, but can’t resist sitting and writing in the middle of one of the busiest and most visual places in the world. Saturday was a pretty hectic day. We left our room about 8:30 am and didn’t return until about 1 in the morning. Our day started with a bonus we hadn’t anticipated when we planned our trip to New York. Our friend Kathy was in town visiting her daughter Carrie, arranging final wedding plans for Carrie’s May wedding. 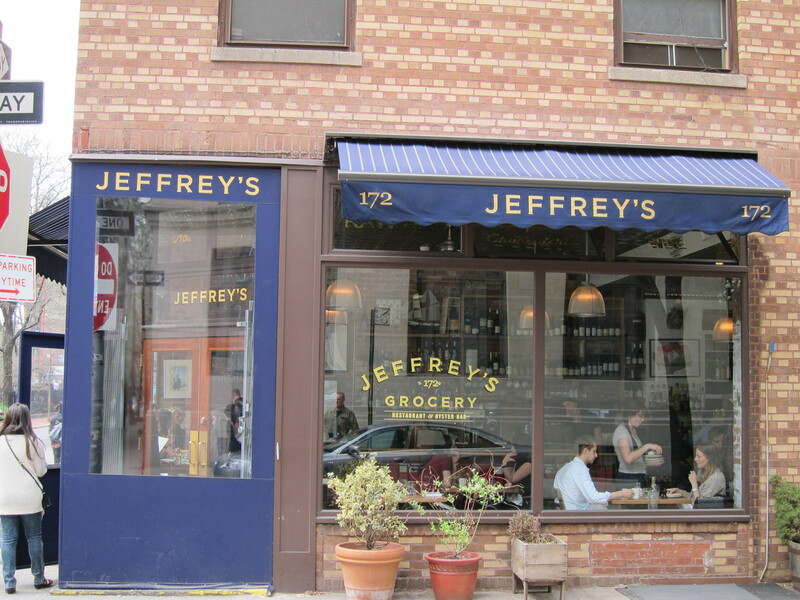 So we were lucky enough to join them for brunch at Jeffrey’s Groceries in the West Village before starting our three-show day. What always amazes me about true friendships (our extended family) is that no matter how much time passes between connections, it always feels like home. I’m not even sure how it started but back when we did shows with Carrie, we became her “Other Dads“. Carrie, her Mom Kathy, and Gary (her Dad) have always been some of the most special people to us. We’ve always had a great time with them and developed a special bond. Carrie’s fiancee, Joel was a welcome addition to the clan. So Michael and I headed down to the West Village early and Michael got his “New York haircut” while I enjoyed the Spring morning in McCarthy Park. Then we met up with Kathy and Carrie for a memorable brunch… reminisced.. and talked about the exciting wedding plans. When we said our good-byes and Carrie and I hugged, she looked into my eyes and said, “I love you.” I melted. Our daughter, who we’ve know since she was 12, is all grown up…sigh… and I’m getting old (smile). 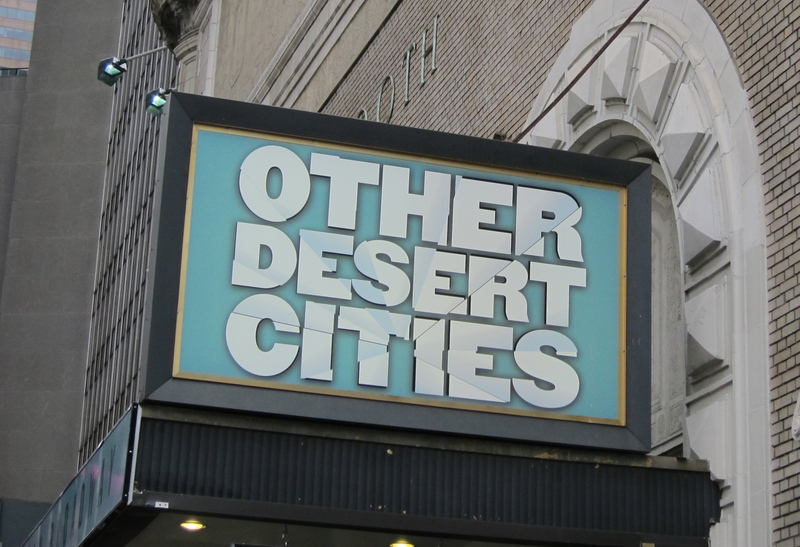 We hopped on the subway and made our way back to 46th Street for our first show of the day, Other Desert Cities. It was an enjoyable play that packed a punch but I thought it was trying too hard to be a classic like Arthur Miller’s All My Sons— it felt a bit forced. For me, the best part was finally seeing Judith Light on stage. From there we went to see a little off-Broadway piece called, Miss Abigail’s Guide to Dating, Mating & Marriage. It was a fun little piece but a bit of a disappointment. I felt the production values were severely lacking– but the resources were there. Definitely a tourist-type show, not aimed at the serious theatre-goer. 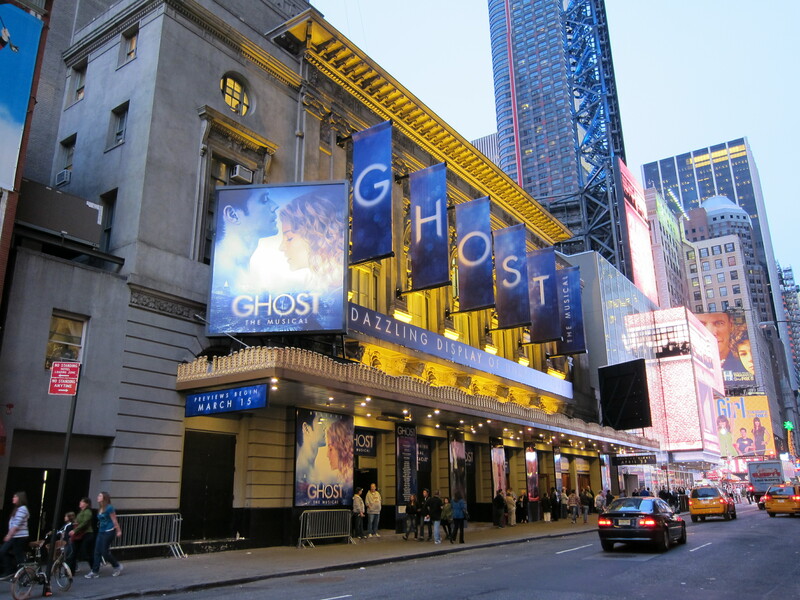 Our final show of the day was the musical adaptation of the movie, GHOST. I’d listened to the cast recording in advance and thought is sounded promising. Our Chicago friend, Amy was able to join us. It was our first great production of the trip. Beautifully staged and performed, it was a visual wonder. Anyone obsessed with the movie would be pleased and the musical stands on its own as a solid entertaining piece of theatre. The new musical adaptation, GHOST. Afterwards, Michael went back to the room exhausted and Amy and I went to Starbucks to chat before I walked her back to the subway. When I got back to the room, Michael was asleep. I know this because after knocking and jiggling the door for 15 minutes, I had to go back down to the front desk to try and call the room. He didn’t answer. The desk clerk scrambled to try and find a key– with no luck. (Keep in mind they use real keys and suggest you leave them at the desk when ever you go out because they don’t have replacements.) The clerk ended up waking the security guard and sending him down to get the only other key from housekeeping so he could let me in. When I got in the room, Michael was suddenly awakened– groggy but awake. By jlinamen1229 in Uncategorized on March 26, 2012 .